Limit: 3 pictures per member. 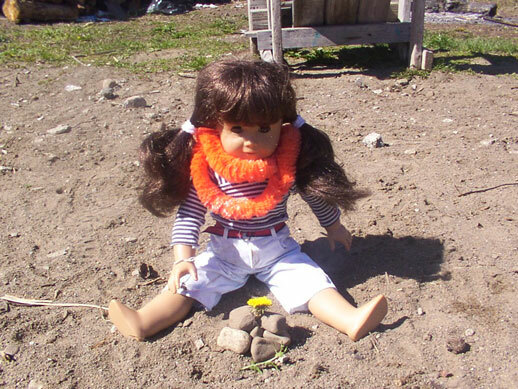 Ann (webmiss): Her dolls on the Fourth of July. 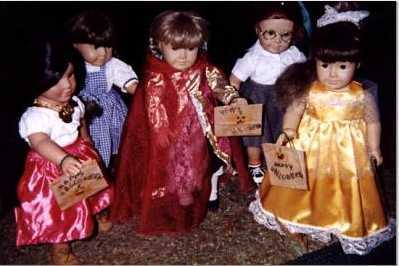 Angela: Angela's family's AG dolls ready for Halloween. Her mom made all the costumes! 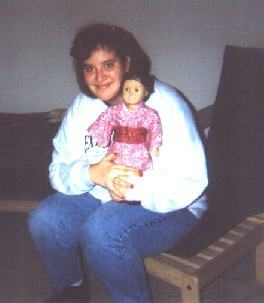 Laurie Timmons: Here she is with her Felicity doll wearing a kimono, which she made for a Humanities class about Asia. 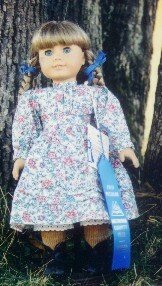 Sandee Bartel: Here is Kirsten wearing a dress which Sandee made and won a blue ribbon for! 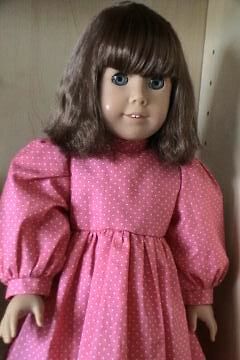 Here is Samantha wearing another dress Sandee made. 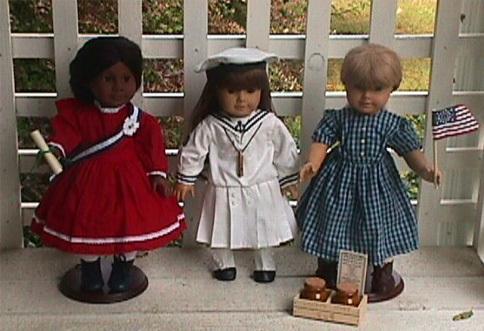 Sandie Lohiser: Here are three pictures from Sandie's website, American Doll Boutique. 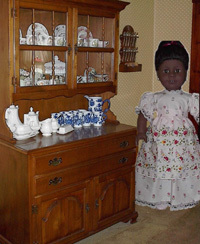 Sandie made the clothes featured in the pictures. 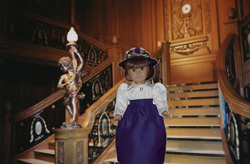 #1--Samantha on the reproduced Grand Staircase of the Titanic. #2--Addy at a home built in 1804 in a small Quaker town in upstate New York. 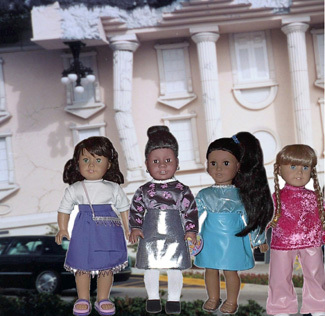 #3--An awesome foursome in front of a unbelievable building in Florida. 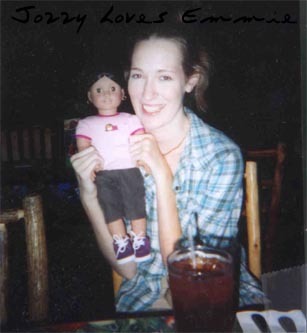 Elizabeth Heun: Here is her granddaugther Brittany with Molly. 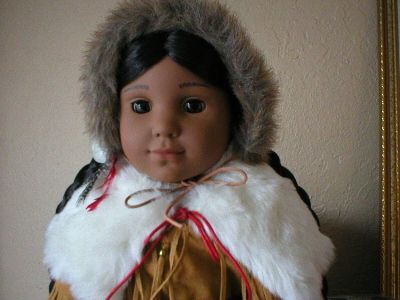 Susan R: Her recent acquisition--Kaya. Greta H: These pictures are from a party she and her daughters had to welcome an AGOT to their home. Josefina, Felicity, and an AGOT playing with a knitted ball. 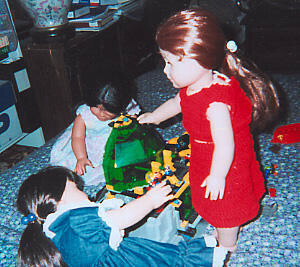 Same dolls playing with Undersea Adventure Legos. 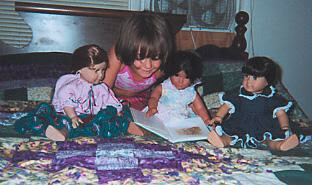 Her 5-year old and the dolls reading the Tales of Peter Rabbit. 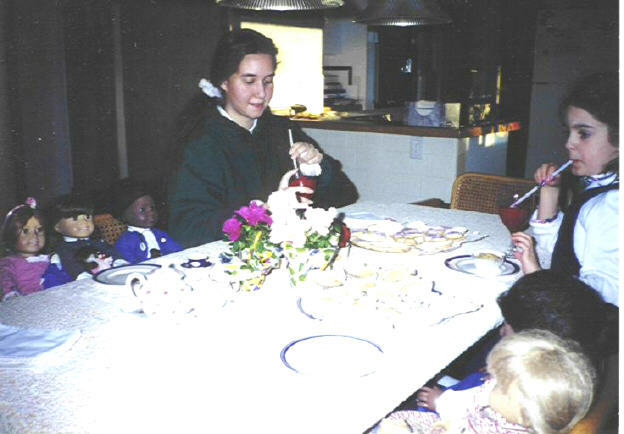 Robin: Having a Valentine's Day tea with Shrewsbury cakes on Valentine's Day 1995. From left to right: My Felicity, my sister's Samantha, My friend's Addy, Me, my friend, My Addy, my Kirsten. 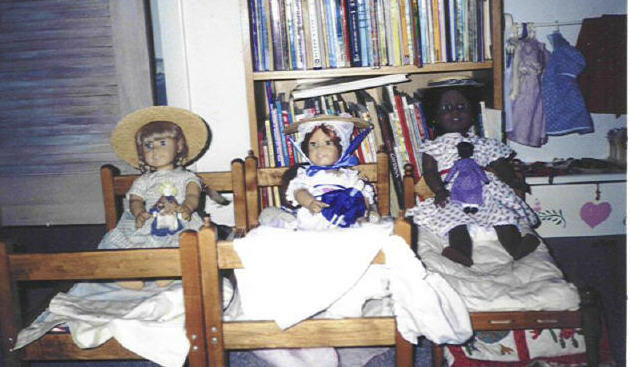 Kirsten, Felicity, and Addy hanging out in their bedroom. 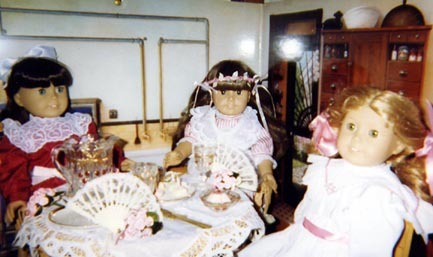 Note the dress stand/trunk in the far right hand corner. My Dad and I made it and stenciled it. 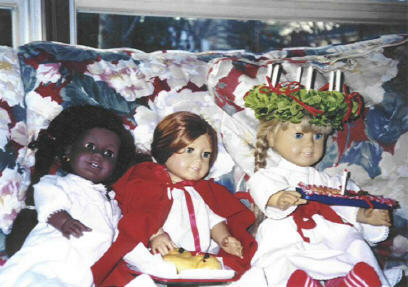 Addy, Felicity, and Kirsten dressed up for St. Lucia Day in 1994. 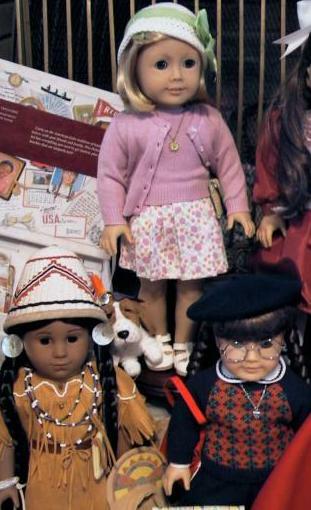 Emily P: Emily's dolls dressed for the holidays: Samantha making cookies and Josefina with her lantern. 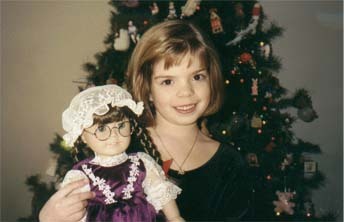 Diana Best: The AG dolls she got for Christmas and all of her dolls among the Christmas presents. 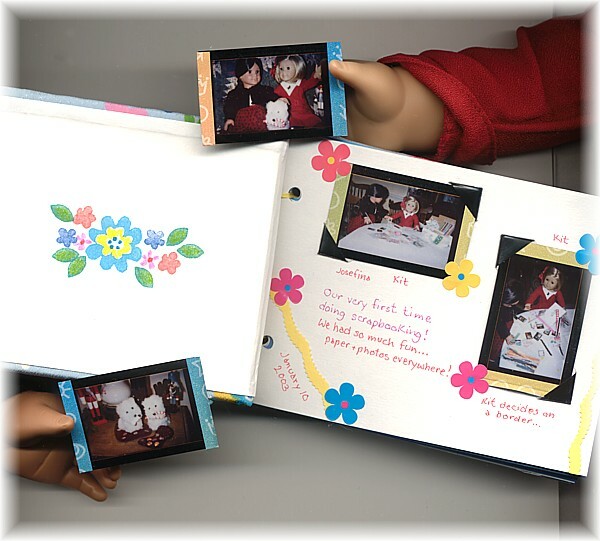 Julia: Two pictures   of Kit and Josefina scrapbooking. 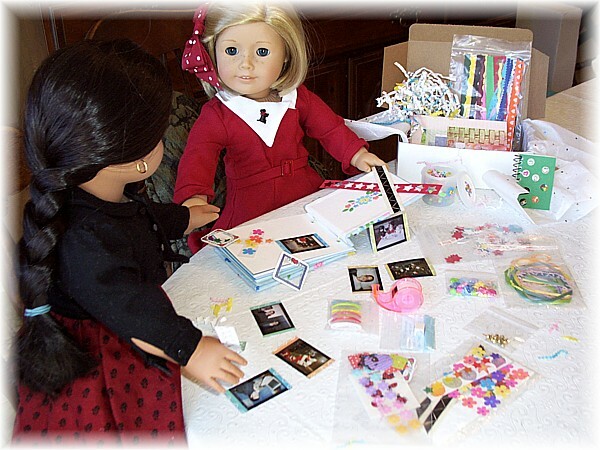 Julia says: "I love the pictures because my dolls are doing crafts, girls after my own heart. We're three peas in a pod when it comes to scissors, paper and glue!" 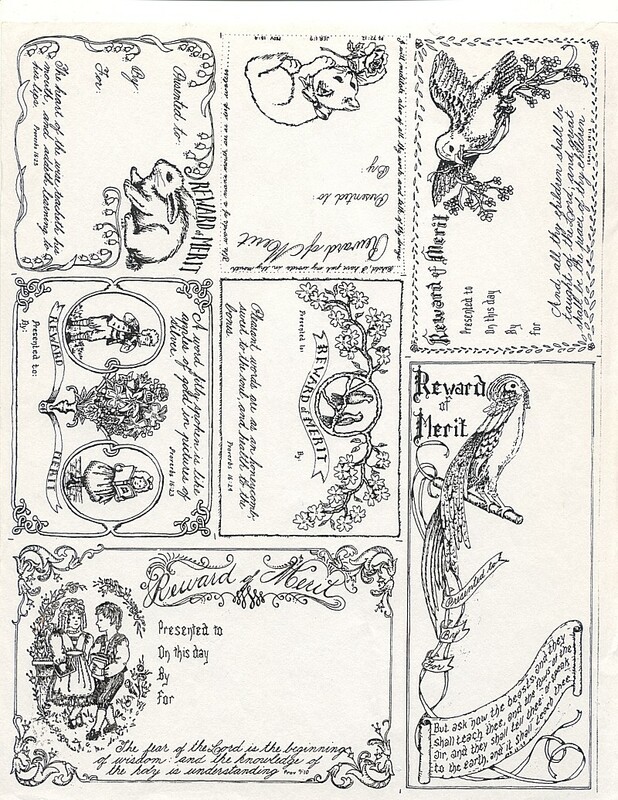 Julia also made some Rewards of Merit such as Kirsten received in school. 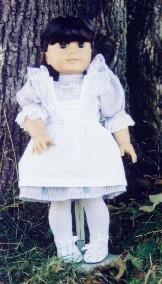 She sent me a scan of her artwork so that others could print it out, color it, and give Rewards to their AG dolls. Click here to pop up the Rewards of Merit in a new window. 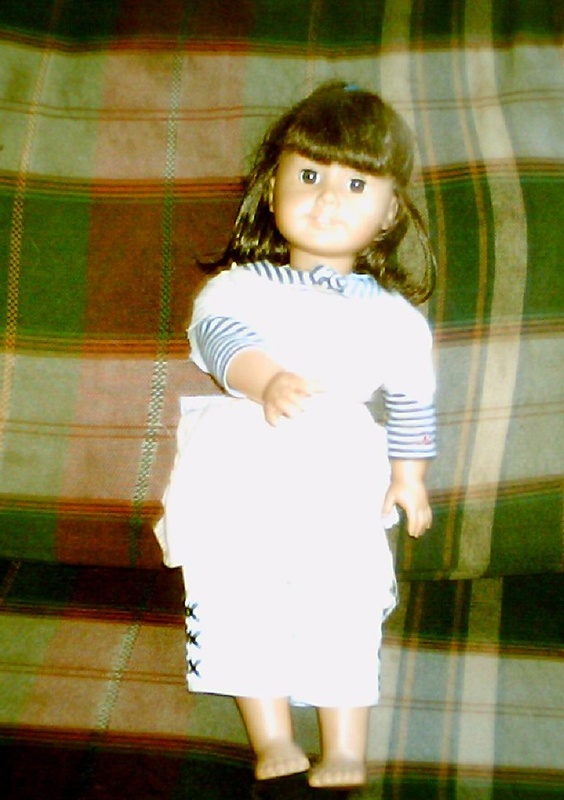 Jec Zinder: Jec shares with us her creation: a Nellie doll. 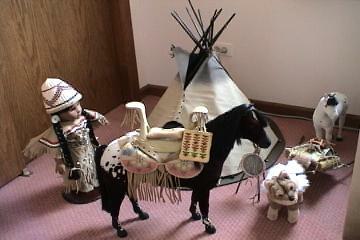 She also shares pictures of her Kaya collection and some of her other AG items. 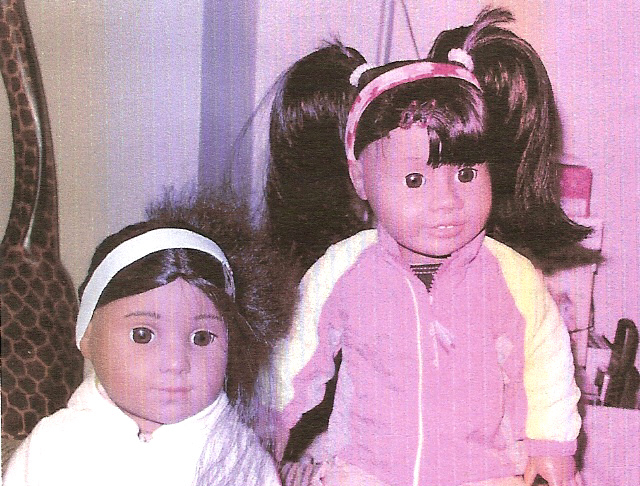 Shauna T: This is a photo of her doll Jaylynn (left) and her mother's doll Gabriella (right). 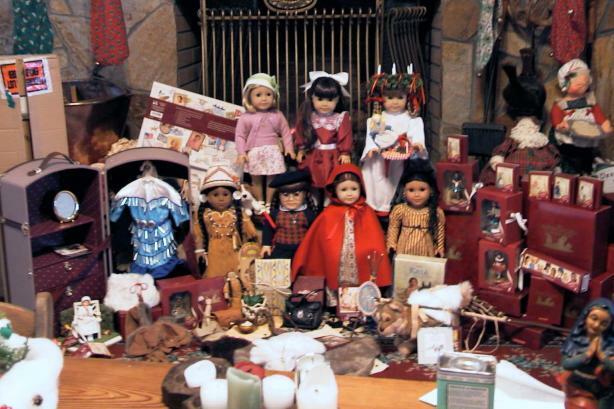 Tari Hann: A picture of 18 of her dolls plus 2 of her daughters' before the 19th and 20th recently joined them. 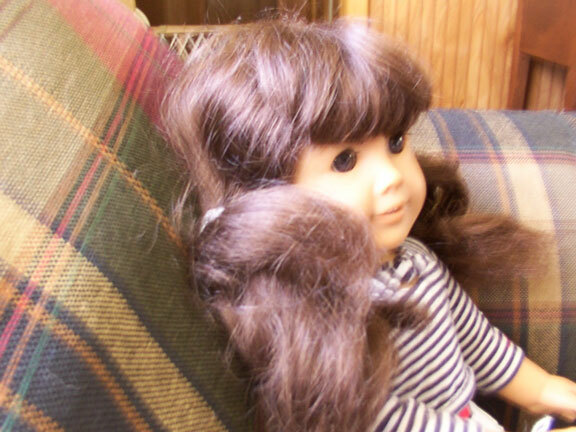 Esme P: Her Samantha with long hair; another pic of Samantha with long hair; her Samantha after a haircut. 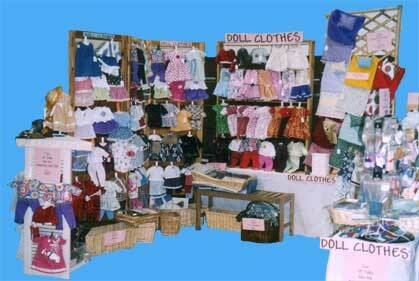 Hunter Southern: Hunter displays all her dolls' clothes, which belong to her 28 American Girl dolls. She also shared a picture of her grand living room and Kailey with her bunkbed that she shares with Samantha. 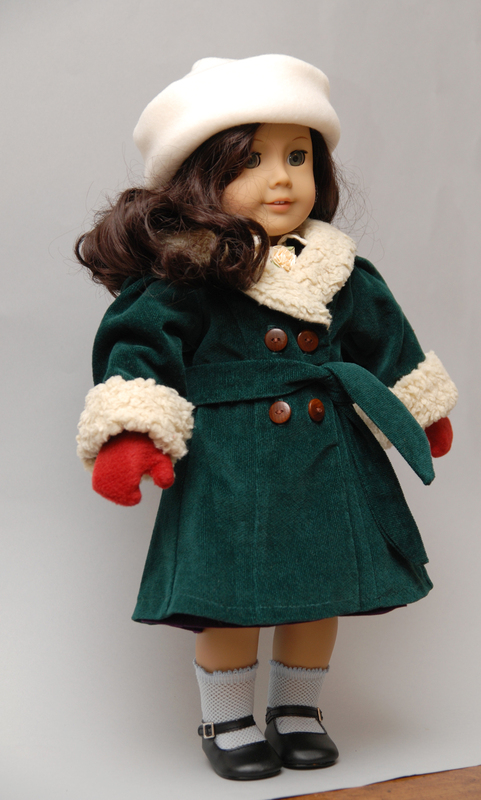 Renee Adams: Ruthie wearing Renee's handmade version of Ruthie's coat. Do you have a picture you want to appear on this page? Submit it!